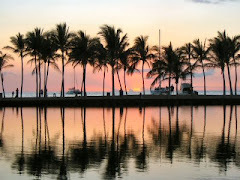 I suggest that at the end of each session, each person resolves to introduce one regular practice into his or her life. This resolution should, for example, be "realistic." 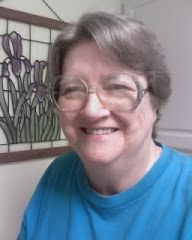 It has to be something that you can feasibly include in your daily routine; it should be challenging, but not so demanding that you give it up after a few days; it is no good saying, for example, "I am never going to say another unkind word to anybody in my life ever again" ~ because this just isn't going to happen. It should be something really concrete: "I am going to go out of my way to perform one act of kindness each day to somebody (make a list of candidates!) who really annoys me." The resolution should also be practical. It shouldn't be something vague, such as "I am going to open my heart to the whole world." That is meaningless unless it becomes a concrete reality in your life. Be creative and inventive; there is no need to stick slavishly to these suggestions: think of ways in which your actions can become a dynamic and positive force for change, not just within yourself but in the world around you. Make each resolution a regular part of your life, and by the end of the course you will have twelve new habits that should be effecting a transformation within yourself and your immediate environment. 1. In the preface, Armstrong writes that our "egotism is rooted in the 'old brain,' which was bequeathed to us by the reptiles that struggled out of the primal slime some 500 million years ago" (p. 13). Even though we've developed a "new brain" endowed with the power of reason, our instincts for survival "are overwhelming and automatic; they are meant to override our more rational considerations" (p. 14). Why is it important to the practice of compassion to understand the functions of our old and new brain? 2. "The Buddha's crucial insight was that to live morally was to live for others" (p. 40). Why was it not enough for the Buddha to attain "the very highest states of trance" and practice "fierce asceticism" to attain enlightenment? What was missing? 3. Confucius believed that "when people are treated with reverence, they become conscious of their own sacred worth, and ordinary actions, such as eating and drinking are lifted to a level higher than the biological and invested with holiness" (p. 42). He also believed in "a constantly expanding series of concentric circles of compassion" from family, to community, state, and world (p. 43). In what ways do Confucius' beliefs apply to our world today? 4. Armstrong writes that compassion is central to the three monotheistic religions, Judaism. Christianity, and Islam. What stories, quotes, or passages stood out for you in this chapter? What stories or myths in your cultural, religious, family, or other traditions emphasize compassion? 2. 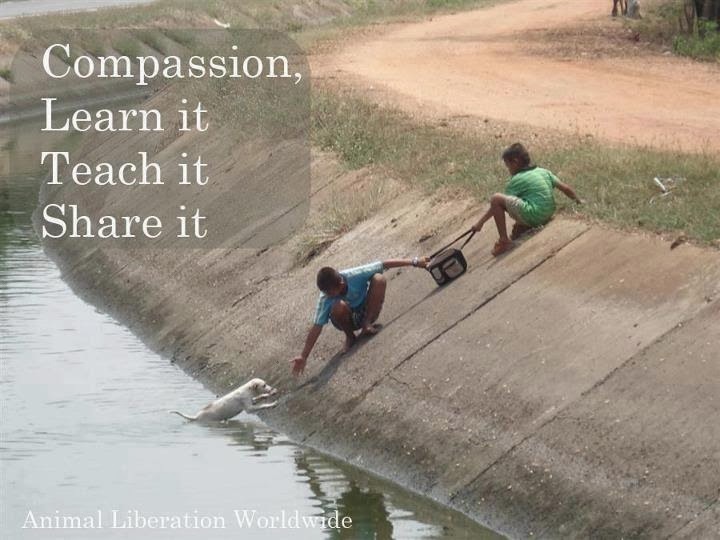 Examine the teachings of your own religious or secular tradition about compassion. 3. Revisit this passage on page 63: "Each of the world religions has its own particular genius, its own special insight into the nature and requirements of compassion, and has something unique to teach us. By making room in your mind for other traditions, you are beginning to appreciate what many human beings, whatever their culture and beliefs, hold in common. So while you are investigating the teachings of your own tradition, take time to find out more about the way other faiths have expressed the compassionate ethos." 4. For the next month, keep a journal of notes, passages, poems, thoughts on what you learn about compassion (p. 27). 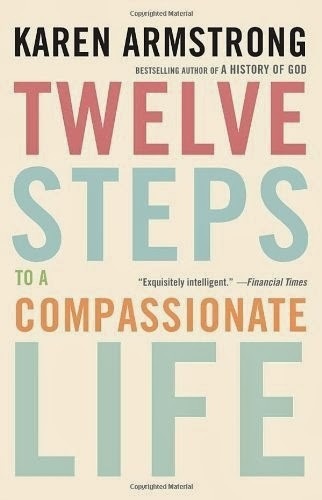 Karen Armstrong starts her Twelve Steps to a Compassionate Life with a preface about her Wish for a Better World. "All faiths insist that compassion is the test of true spirituality," she says (pp. 3-4). And again: "At their best, all religious, philosophical, and ethical traditions are based on the principle of compassion" (p. 24). "Yet sadly we hear little about compassion these days. I have lost count of the number of times I have jumped into a London taxi and, when the cabbie asks how I make a living, have been informed categorically that religion has been the cause of all the major wars in history. In fact, the causes of conflict are usually greed, envy, and ambition, but in an effort to sanitize them, these self-serving emotions have often been cloaked in religious rhetoric" (p. 4). Today, I ran across a short interview entitled Religion is not the source of conflict. You may want to read it, especially if you don't have the book we are using. 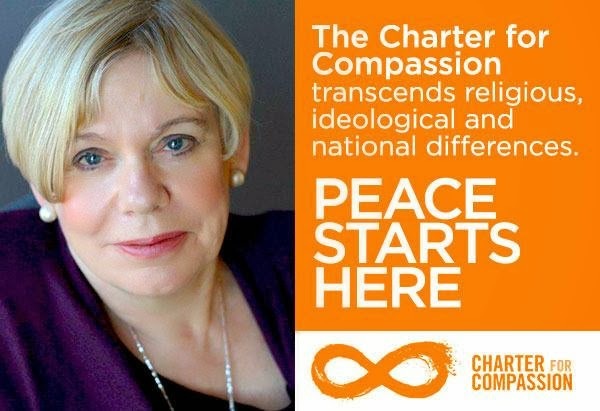 The text of the Charter for Compassion is found on pages 6-8 in the book and on the Charter for Compassion site, where you can also sign the Charter, if you haven't already. Also available is a printable flyer of the Charter. to cultivate an informed empathy with the suffering of all human beings — even those regarded as enemies. The final version of the Charter was composed by a Council of Conscience made up of individuals from six faith traditions: Judaism, Christianity, Islam, Hinduism, Buddhism, and Confucianism. 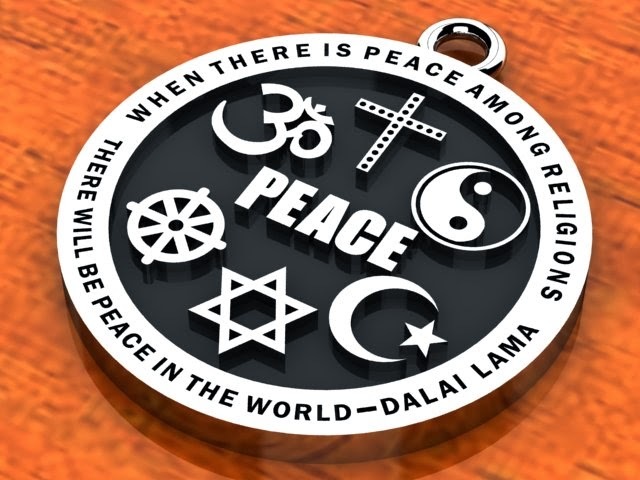 As I type this post, I'm wearing the peace medallion (pictured here) with almost the same six religions. The ying-yang symbol usually indicates Daoism (Armstrong's preferred spelling for Taoism), but it could represent all Chinese spiritualities. Going clockwise from the top, the religions represented are Christianity, Daoism, Islam, Judaism, Buddhism, and Hinduism. 1. What has been your experience of compassion and — on the other hand — the growing "extremism, intolerance, and hatred" (p.6) that leads to further alienation. 2. How do you feel about Armstrong's desire "to encourage a positive appreciation of cultural and religious diversity" (p. 7) and "to transcend ... religious boundaries" (p. 8)? 3. What does "compassion" actually mean (p. 8)? How can we "translate [it] into practical, realistic action" (p. 8)? 4. What words have you looked up so far? Is it important to you to understand the nuances of words like "numinous" as used in Armstrong's mention of cave art? "Their depiction of the animals on whom these hunting communities were entirely dependent has a numinous quality" (p. 16). 5. "Because it runs counter to the Darwinian vision, advocates of evolutionary theory ... have found altruism problematic" (p. 12). Is this going to cause a problem for Armstrong's ideas about compassion? Are we humans too selfish for this to work? 6. Did you pick up on Armstrong's reason for making this a 12-step program (see p. 23)? What's our addiction? SCHEDULE: I plan to begin our discussions of each step on the third Monday of the month. The discussion itself, however, can continue the entire month — or any time after that, "forever." If newcomers happen upon this after we've completed our discussion, I'll try to pick it up again with them. The First Step will be posted on Monday, January 20, 2014. 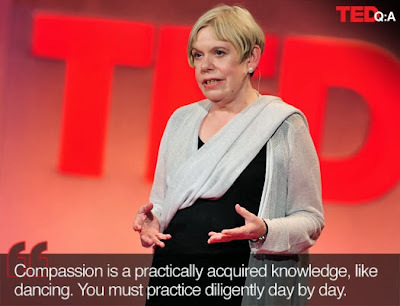 Karen Armstrong won the 2008 TED Prize and with it her "wish to change the world." Her goal was to create a Charter for Compassion. You can view the video of her "TED Prize Wish" on the Charter for Compassion homepage (on the right side of the page). Thousands of people contributed to the process and the Charter was unveiled around the world in November 2009. I'm one of the original signers. The organization has inspired community-based acts of compassion all over the world. The goal of this study is not to "learn about" compassion, but to PRACTICE compassion. 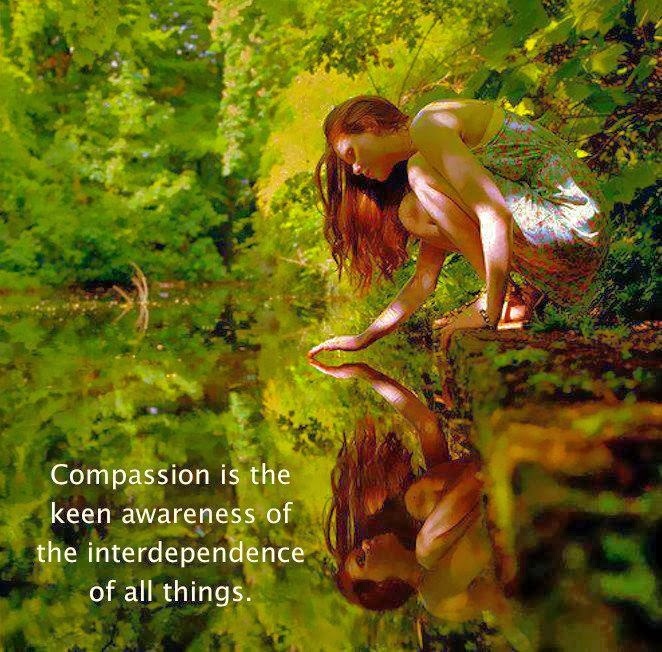 The Charter for Compassion has provided an organizer's guide which includes discussion questions, but also includes ACTIONS for each of the twelve sections. In other words, we will practice being compassionate during the month we discuss each step. In this important and thought-provoking work, Karen Armstrong — one of the most original thinkers on the role of religion in the modern world — provides an impassioned and practical guide to helping us make the world a more compassionate place. The twelve steps she suggests are listed below. We'll look at one step a month. 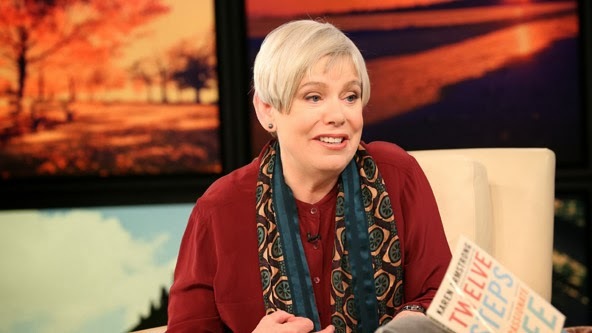 She shares concrete methods to help us cultivate and expand our capacity for compassion and provides a reading list to encourage us to “hear one another’s narratives.” She teaches us that becoming a compassionate human being is a lifelong project and a journey filled with rewards. We may also choose to read other books together during this year, but for this book on compassion, we'll take one step a month. I'll post something about each chapter during that month, and our discussion will be in the comments on that month's post. Leave a comment on this post, if you want to study with us. 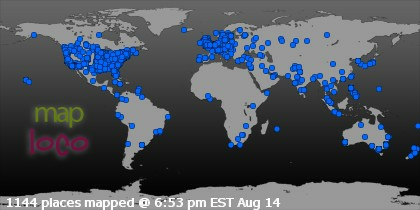 You are welcome to join us, even if you don't get the book, since this is an action-based study. You will, of course, learn even more from reading the book. When you get the book, read the preface and tell us here what you think about the meaning of compassion, the charter, the Golden Rule, or anything you read about in the preface.